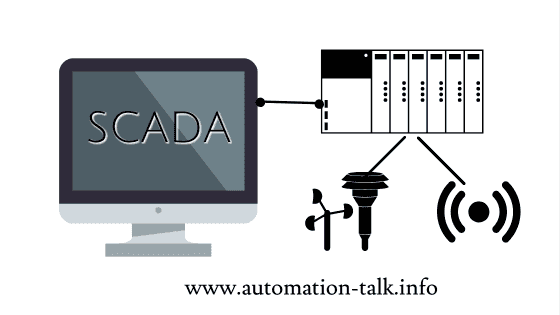 SCADA is an acronym for "Supervisory Control and Data Acquisition" and is used to see the graphical view or real time view of the process in Industries with the help of a PLC and a SCADA software communication together through the protocol. It is a key component of industrial automation. You can also control the process sitting in the control room from far away and monitor the changes and record them for further use. Now, even mobile applications are available through which you can control all your equipment connected to SCADA software. Subscribe to Automation-Talk by Email. SCADA is a control system design that uses PC, networked data communications and graphical user interfaces for high-level process supervisory management, but uses other peripheral devices such as PLC, HMI and discrete PID controllers to interface to the process plant or machinery. The supervisor uses SCADA software to set parameters, issue commands or monitor the whole industrial plant. However, the real-time control logic or controller calculations are performed by networked modules which connect to the field sensors and actuators. 1. Computers or Laptops: This is one of the key components of SCADA system and is used to as the main interface between machines and user. 2. Remote terminal units (RTU's): RTU's are connected to the sensors and actuators, which are further connected to the industrial machines, and are networked to the supervisory computer system. RTUs are "intelligent I/O" and often have embedded control capabilities such as ladder logic in order to complete the boolean logic operations. 3. Programmable logic controllers (PLC): It is popularly known as PLC and is the heart of the complete system. PLC's are programmed to do automation and do all the calculation which is needed for the desired process. There are many popular PLC languages and the most popular one is "Ladder Logic". 4. Communication infrastructure: This connects the supervisory computer system to the remote terminal units (RTUs) and PLCs, and may use industry standard or manufacturer proprietary protocols. 5. Human-machine interface or HMI: HMI is also one of the key components in SCADA system. is the operator window of the supervisory system. It presents plant information to the operating personnel graphically in the form of mimic diagrams, which are a schematic representation of the plant being controlled, and alarm and event logging pages. The HMI is linked to the SCADA supervisory computer to provide live data to drive the mimic diagrams, alarm displays, and trending graphs. There are many companies which are providing HMI hardware and software. SCADA is a very big topic if we discuss each and every part of it. Hope you have got some basic information about SCADA through this article and what is it. If you like the article please do not forget to subscribe to our channel and do let us know, what other articles you would like to see on our blog.